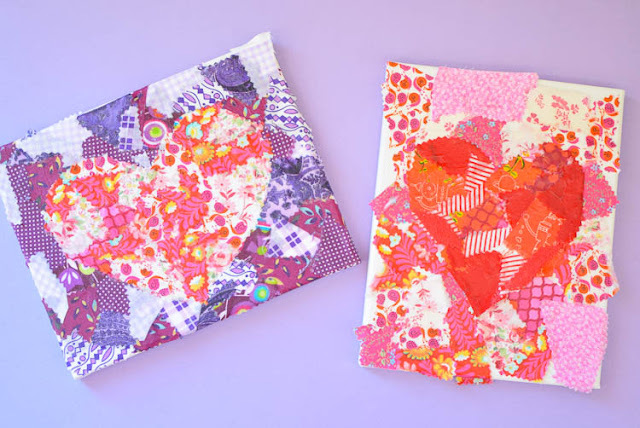 My girls both loved making these Fall Fabric Collages last year, so we decided to make a sweet Valentine's Day version! 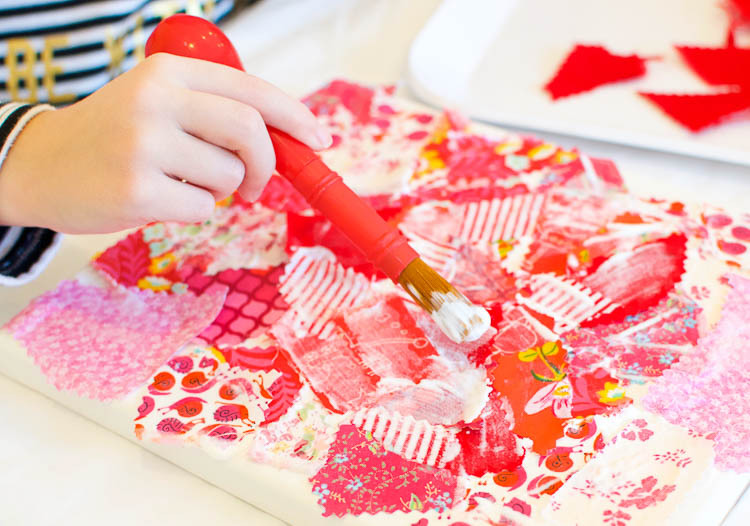 They're such a pretty craft, and a great way for kids to make some truly beautiful art! 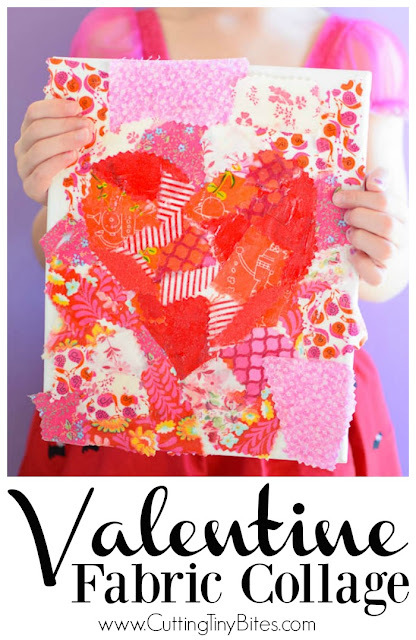 Add a Valentine Fabric Collage to your to-do list! Time to raid your fabric stash! Gather pinks, reds, purples, and whites. 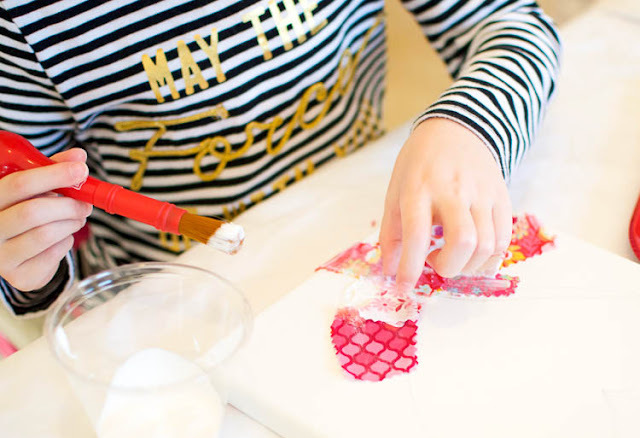 If you're doing this project with just one child, pick only two colors- one for the inside of the heart and one for the outside. 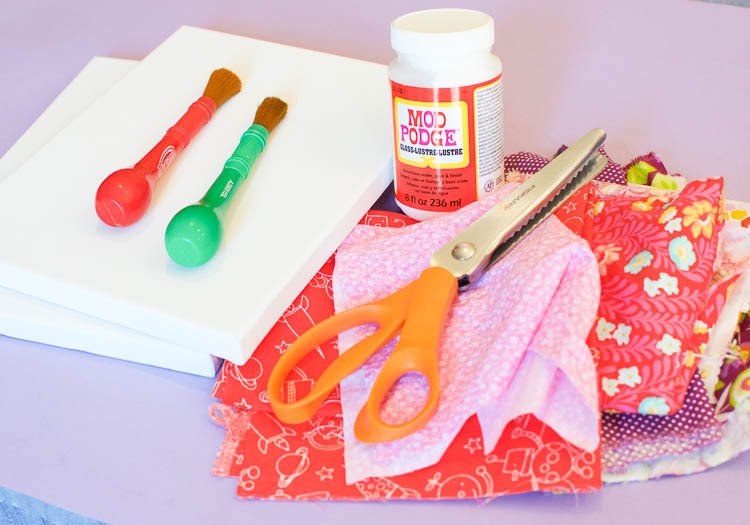 You'll also need some pinking shears, canvas, Mod Podge, and a paint brush. Cut your fabric into little scraps. Get plenty of variety in size and shapes. I put ours in separate stacks. 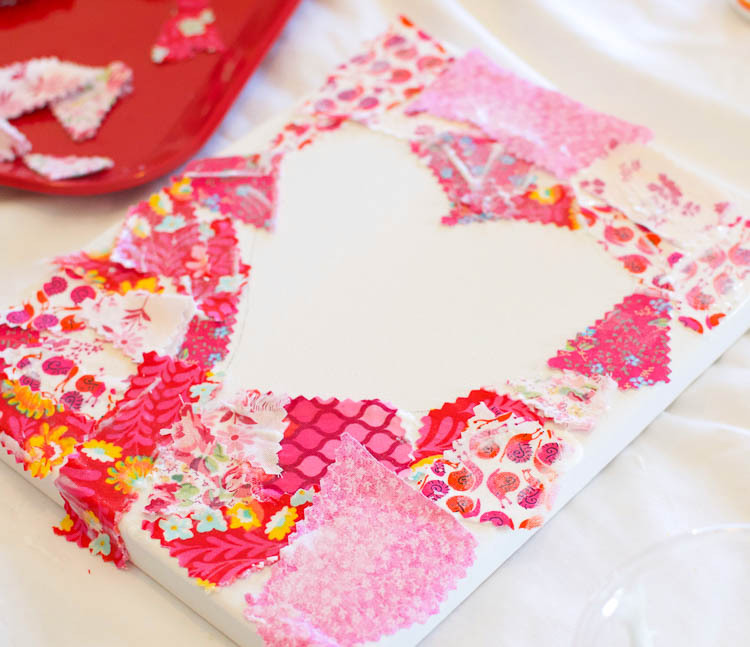 Draw a simple heart shape in the middle of your canvas. You can use a printable template to trace if your freehand skills are shaky. Mine is hard to see in these pictures, but it's there, I promise! Show your child how to paint a thin layer of Mod Podge on the canvas, put down a scrap of fabric, and then paint another layer of Mod Podge on top. You'll use all of one color on the outside. Lena chose pink for the outside of her heart. We did the outside of the heart first. It worked best to do the border first and then work our way out. 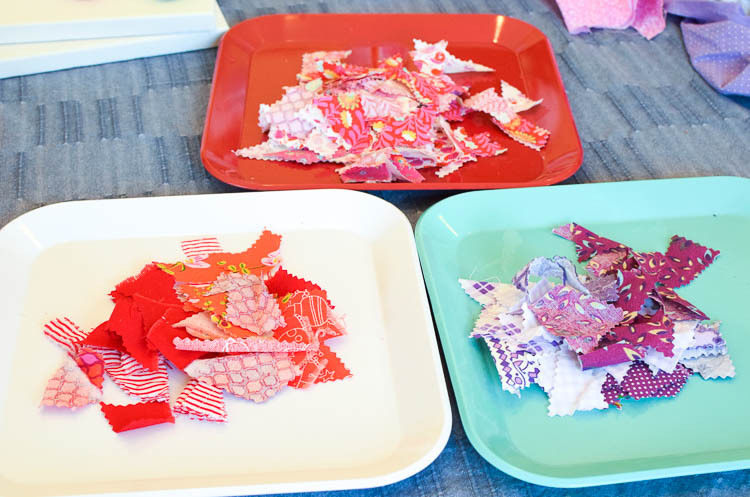 Your child may need some help in selecting fabric pieces that have an edge that will match up with the shape of the heart border. Once you've done the entire outside, move on to the inside! Switch colors- Lena switched to red. Complete the same process with the inside of the heart. Start with the edge, and work your way in. 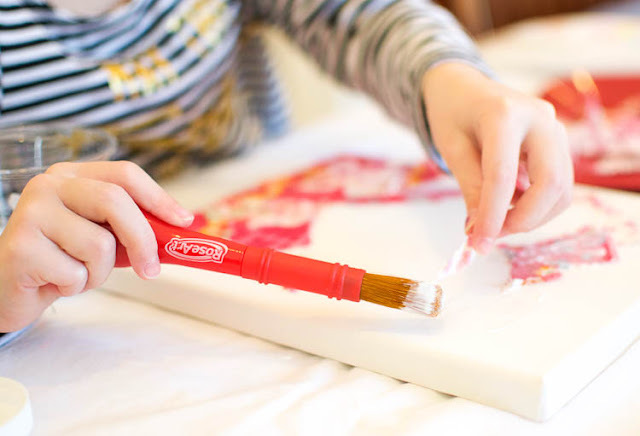 Let the initial layer of Mod Podge dry, and then give it one more coat for good measure. Once Lena's was dry, we found a few spots that needed touching up in order to see the heart shape more clearly. She added some darker red fabric pieces along the border on the inside of the heart, and some lighter pink pieces along the outside edge to increase the contrast. 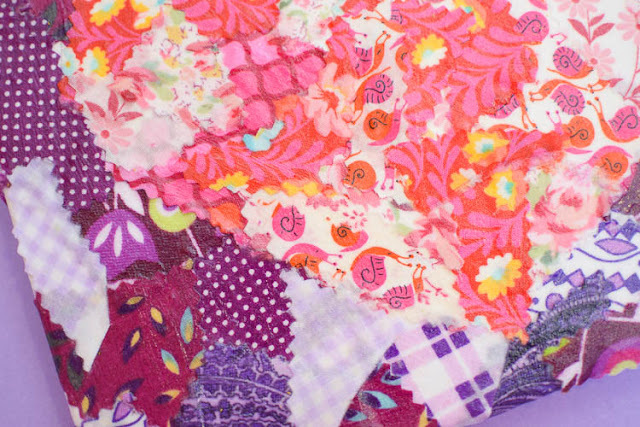 I love the texture and colors of this project! 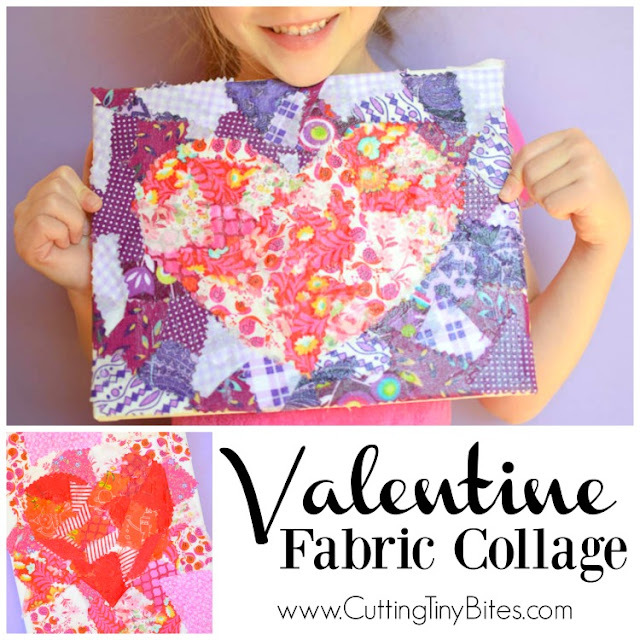 Valentine's Day Fabric Collage- use fabric scraps in shades of pink, red, and purple to make a pretty heart shape. 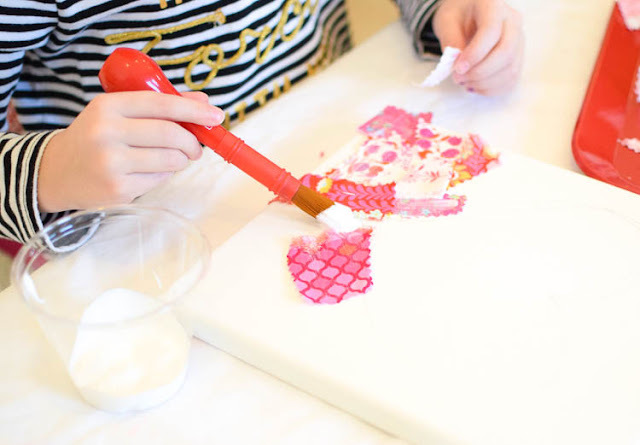 Wonderful process art project for preschool, kindergarten, elementary, or older kids. 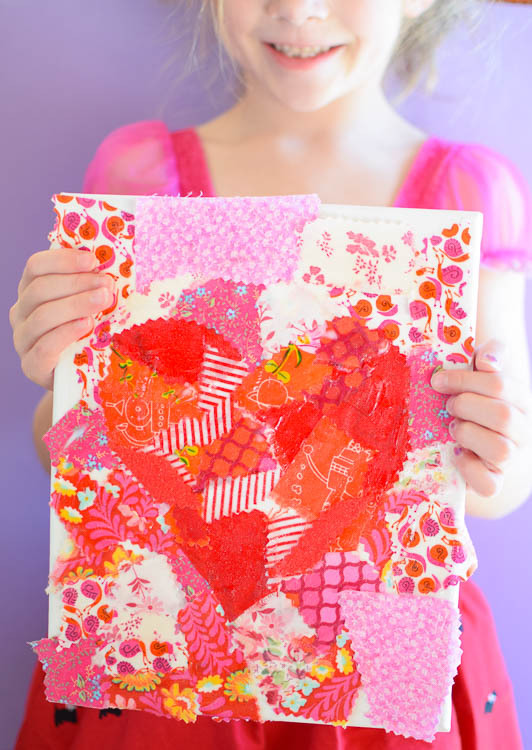 No sewing required!